yes, that is my goal, what is it? I find them not only crazy beautiful, but incredibly useful...I mean foamed cocoa, what else would anyone need in life. So before I aspire to even try and do one of those I went and did the skill builder in the wood lathe aiming to learn how to do the rings first. After this first ring though I noticed that as I tried to work the wood it kept on stoping on me. So I sharpen the tools several times...worried I was doing something wrong because wood was still not being properly chieseled. Then as I was still pushing into the piece the lathe stopped completely, terrified that I was doing something wrong I checked the whole set to discover I had been kicking the connection and finally got it unplugged. But that was not my problem. As I incorporated myself I grabbed on my piece and discovered it was loose. That was the problem!! A little adjustment on the live part of the lathe and I was good to go. I did a big ring, worked the rest of the cubic part in the middle into a cylinder and did another ring that sadly broke. So I would say I have the feel of what it takes to make a ring, but I am a LONG way away from making a decent one, and I say that moving forward I need to find a proper wood to work with, I do know that the mexican shakers are made out of ocote pine which is quite soft. 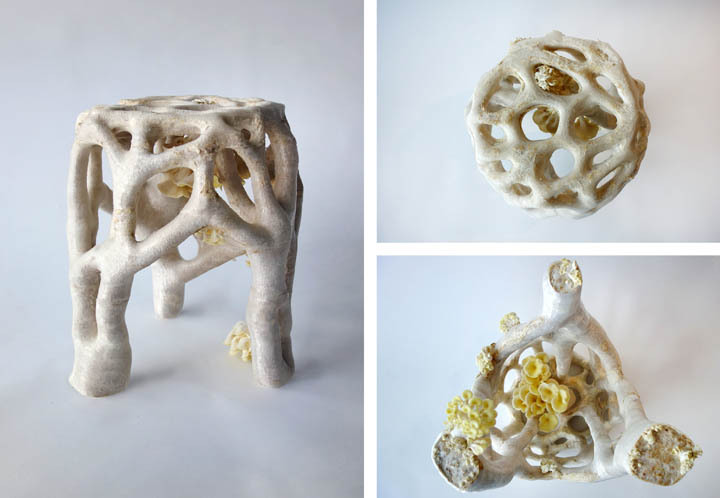 The first thing you learn when you start working with mycelium is that it is not a being, or a plant, but a smart network that represents one of the most important parts of ecosystems: their digesting, soil producing, remediating network. 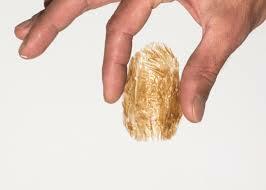 So I first wanted to look into making a mycelium surface conductive enough to be used in a electrical circuit. 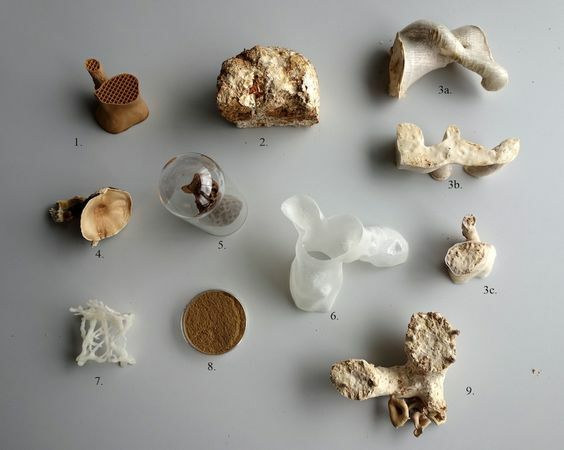 I was lucky enough to find a pattent for elerctrical tissue made out of mycelium that would help create what I understood would be an organic PCB. Then I was able to find out about how different species of fungi produce a certain enzyme that helps electrical cells absorb energy more efficently. 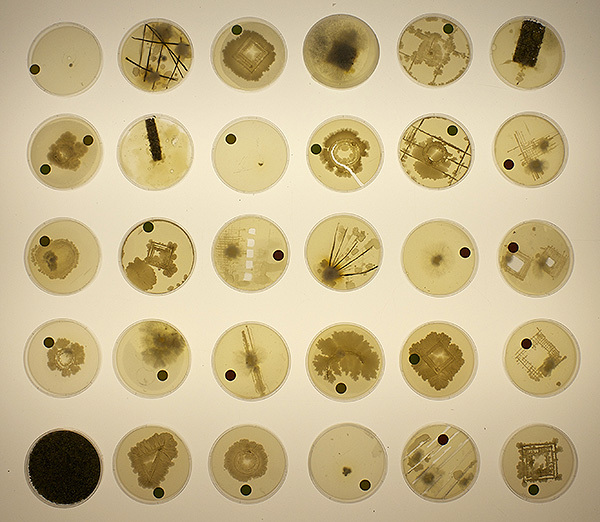 Even though my results were very scarce the amount of work that I went through helped me realize that as much as fungi and mycelium specially are very good in communicating with chemicals and electrical signals harnessing this power so that we can build electrical systems that are not filled with terrible metals and chemicals is not as easy as it seems. But I didn't wanted to give up my quest into finding ways of improving electrical circuits through using mycelium's super powers so that nocive e-waste can be avoided. And so I though of the first and most ubiquitous part of any electronical circuit: buttons and pots. The subject of these strikes really close home since we use tons of them at ITP, I figured I could come up with a manual for a DIY pushbutton that would use mycelium as a substitute for its plastic parts, so that once you were done with it disposing it would mean that the metal could be clipped out of it and reused, while the rest of it would just get integrated into soil. But turns out that buttons and switches require a lot of precision to be ensembled. Something that cannot be guaranteed with mycelium, specially not in a DIY manner. So I went one stage up, into another component of the pushbutton: the cap. Buttons, switches and Pots need caps that make them easier to use and prettier to look at, so I thought that coming up with a process to DIY caps for pushbuttons, pots and switches would be interesting, and would definetly reduce the impact of our circuits once they are disposed of. 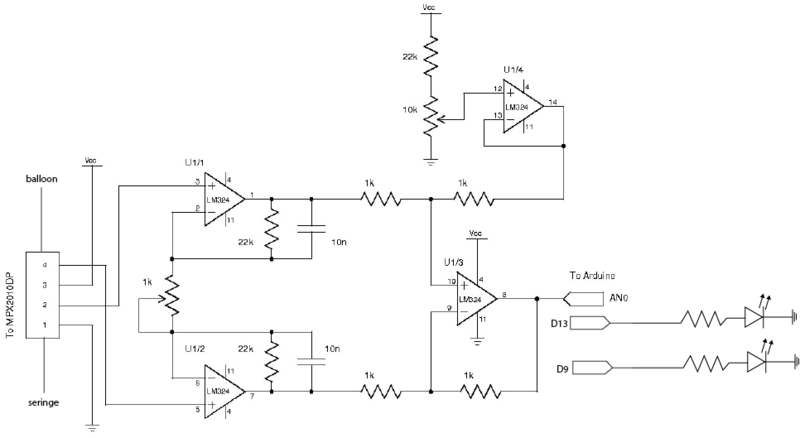 For my final I wanted to pick up on the control report that I did for the class' library (pressure transducer). My intent was to make a control out of water, but I soon discovered that fabricating said control would need a lot of precise trial an error in order to control: the flux of water, its containment and its proper messure, not to mention be sure that non of the liquid escaped into the electronics. So in order to conduct a more controlable experiment I decided to use air. And since I had to messure pressure diference in order to get readings I was attaching to one end of my pressure reader a seringe and to the other an inflated ballon (mostly inspired by my professor Tom Igoe who had repeatedly suggested using ballons or air pumps to create a weee-woo efect in light). So that by mantaining a constant pressure on the seringe end I could map the change of pressure in the ballon and use this difference to trigger a HIGH in a digital pin. The example circuit and sketch I initially used were adapted from a project meant to measure the amount of water poured into a water container. 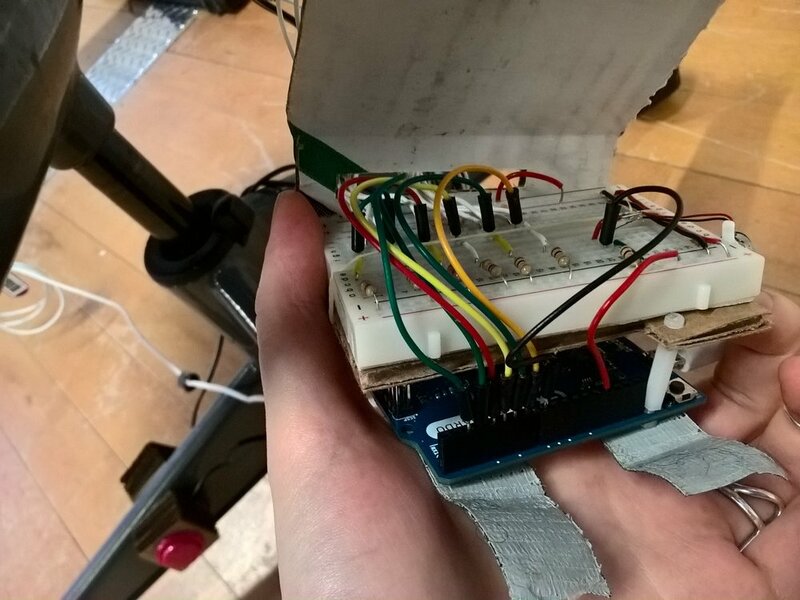 This project intended to send the information through a wifi shield into a server, but since I was not using that I removed everything else in the sketch and just monitored the readings. After getting the proper readings I went ahead and attachend the ballon to one end of the pressure transducer and a seringe on the other. So in order to manage this readings I directly used the free hand calibration example from Arduino, I stuck to this sketch and focused more on the fabrication, trying to understand how to get to a more or less controllable stage, and most importantly: getting an LED inside a ballon. Automatas are fun, not just because of what they can do, but because building them requires a lot of wit. 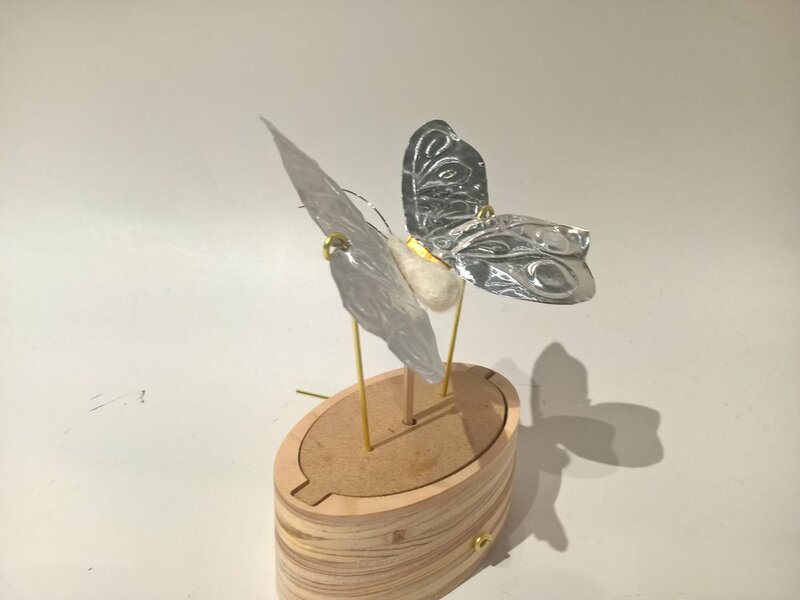 I've been obssesed with making a butterfly, so I figured that having the possibility of creating fairly small part would allow me to build a butterfly automaton that could work through a small music box. This meant that I decided to use the Other Mill, following basically the same steps as I did for the skill builder. Using this time: plywood and MDF as materials. Working on the Other Mill gave me not only the capability of creating really small parts, but also became an excellent tool for quick iterating. Something very important since my time contrains were very high due to the fact that I spent a really long time researching how to do my automata. This meant that I went over the same shape several times, trying to understand how to calculate the sizes of my design on the CAD, because even though I was using the digital caliper all the time it is still very hard for me to imagine how much my piece would loose on its contour.. Since Other MIll's CAM is incredibly straight forward redesigning on Illustrator was the only time consuming part of the production. These iterations let me test the weakeneses of the design, which I will try and improve, starting by the mechanism doing exactly what I want it to do instead of just an approximation. I tried to imagine controls for people who were sight impeded or try to see how I controlled my own music when the controls were out of reach. Since both ideas landed me in not so fertile ground, I kept on thinking for an alternative. 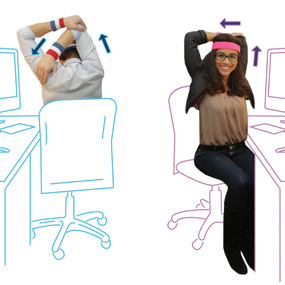 Thinking while sitting in a desk can get tiresome, being on that chair for so long makes you want to strech out...Eureka! When I streched out in my chair I discovered I was reaching out to spots in my chair that I couldn´t see, only see. 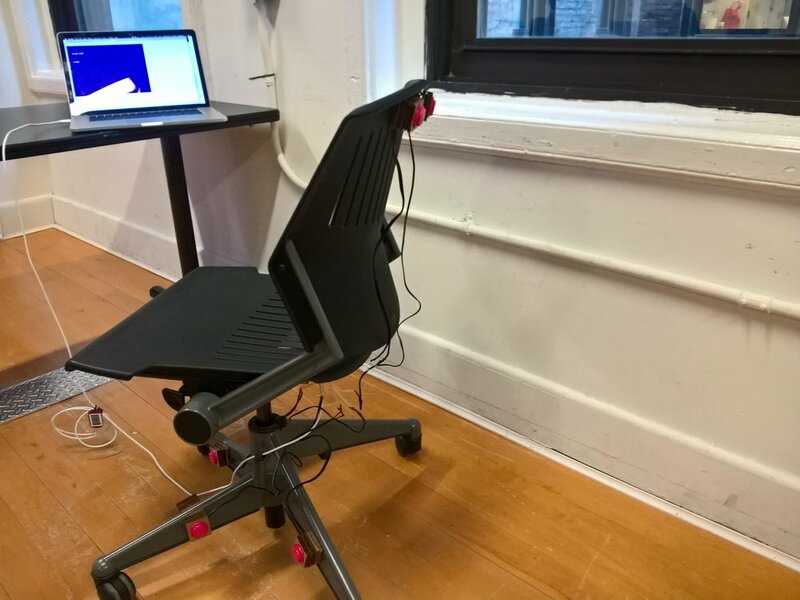 So this is how the idea of placing buttons around an office chair so that moving through the music will mean yo needed to strech out was born. 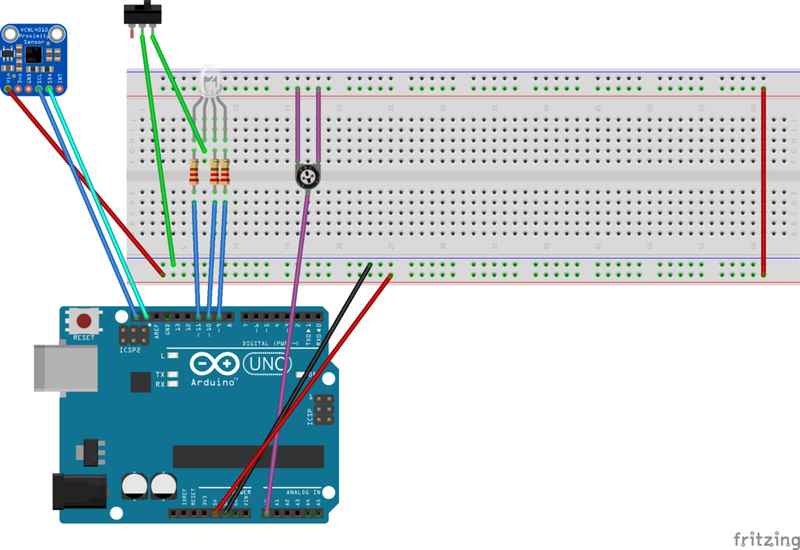 Due to my lack of expertise in serial communication, I decided to use the Arduino Leonardo in a way similar to what I did for the Moon Lander. I had to modify the keys and add two more and with Jing Wen´s help figure a new logic for them to work in the smoothest way possible. I also added one more pin in order to place the vibrating haptic motor, which didn't work in this environment, as it was only sensed by one of the people who tried it. So probably I either needed to have a larger motor or pass more current through the motor I was using. So I started off as early as I could and with the easiest design I could imagine. two rectangles that were going to meet with a simple square. Apart from loosing my 0 point in MasterCam the cutting process went quite easy, but then it was the problem of the fact that I did not calculated the sickness both of my pieces had to sum up to. Since the first try went fairly well I decided to make my final joint a "Halving with Elliptical Tenon" so I went for the design of a flat cube which will join in one of its "faces" with a circle. And it was ANYTHING but easy. I went through seven different digital designs, one cut that was way to large (my material couldn´t provide enough space for it), one design that was badly cut and finally my piece which due to its size needed to get a little bit of sanding. After these two CNC experiences I come to be more and more convinced that the trick with CNC is all in the software side of it. My great battle this time was translating my design from one program to another into what I wanted it to be. I tried a lot of times, and every time Master Cam translated my design into a set of lines and not many figures together. So I ended up moving to ilustrator to do the CAD, and since I had changed the origin point so many times it was really easy to translate my Illustratod design into MasterCam and then FINALLY the CNC Router. Here I had one more mistake: I realeased one of my figures before I did the central cut, so of course the piece got barely poked but it did not got properlly cut. So it was all about going back to mastercam and rearrengin the order of the operations in order to get my desired piece. So for this project I wanted to do a lamp shade for my brand new hanging lamp but nothing went according to my plan. Once I clicked start the screen on the CAM requested a said Tool 1 == "Load Tool 1" flashed in red letters. John told me it meant that the machine was asking for a machine change, so he just clicked 'RESUME' and the process started. One of my pieces moved and was not cut properly, I was able to sand the cutting afterwards, but it could've been not good at all. Even though the process went fairly ok. My design was very poorly made, to the point that my main piece came out useless due to the fact I did not plan ahead for the thickness of the bit and how much material I was going to loose, and after everything was cut I realized I needed a pocketing that I did not perform in the useless piece but that I could've planned for in the piece that I ended up using. If while on the Master CAM I realize there is a small shape missing from my design or a dimension is not working, is there a way to modify it? I am not a designer so I really do not know how to go about a design process, I tried playing around with cardboard, but the planning and measuring was increasingly demanding that I went for the simplest form I could imagine. And even then I do not feel satisfy with the result. This week's assigment required us to use an RGB LED to create a lamp that would go through different colors, keep the color it was last given, dim its brightness and be turned on and off. My idea was to create a lamp that within itself could embody the controls that will make it work. SInce time constrains represent also project concerns I had to make peace with adapting my original idea to the controls and materials I had available. My huge struggle during this project was with the code. The on and off swich I applyied it to the current, so I just had to play around and understand how the Pot and the Proximity Sensor would modify the colors and the brightness of the LED. Starting off with the color issue I applied for loops that would help me see how the colors changed in an automatic way so that I could break the loop logic and add a control in it. The problem that I dragged form this starting point and throughout was that I sticked with RGB, never moving to HSV. And it mainly had to do with the fact that I started off with this code I found and stuck to it. So after trying different solutions I ended up assigning a color combination transition to every sixth of the pot turn. After realizing I just needed to remove the delay I was able to get the needed effect. Once with a working circuit I moved into fabrication. But appart from the HSV optimization I was left with the curiosity of trying Swich case instead of all the ifs and ANDs I used. Would that make my code more efficient? Since the introduction to python included thinking about how arithmetic operations work I was immediatly reminded of the author of my favorite book Lewis Caroll who had a special like on creating math and word games. Upon looking for word games I could apply for my assigment I ran into Caroll's word ladders and since I was following the class notes to guide me in the assigment I realized I could make my text look like an actual ladder. All this ladder thinking made my mind land on "La Bamba" which is not an origianl song by Richie Valens, or the name of your neighborhood´s hard-shell "taco" joint. "La Bamba" is a traditional "Son Jarocho" a mexican music genre from Veracruz. But I'm getting off track here. The reason I landed in La Bamba was because part of its lyrics go: "Para llegar al cielo se necesita, se necesita una escalera larga, una escalera larga ay arriba y arriba" ("To get to the sky a long ladder is needed, a long ladder and up an up"). And since I was planning of going up there I thought that the first person I would visit in the sky it would be my grandfather. So I decided to develop a program that would build said impossible ladder through Carrolls technique of transforming one word into another, and since land has one too many letters and is way too overated as a place to dwell, I decided to start my climb up from the sea. Because this ladder would be ultimately connecting my grandfather and me. I picked one of his favorite authors and one of her best poems: Emily Dickinson´s "The brain is wider than the sky" and one of my favorite poets and an adequate (and incredibly beautiful) poem of his: Pablo Neruda´s "The Sea"
swap.py - I did various iterations of this one in order to build Caroll's ladder process of exchanging the letters in sea and sky . Have I said how much I'm loving these assigments that do not involve a lot of creation? Well I do, just diving into using the tool is amazing. That said, I have to say in this case I couldn't just dive in, because the only two machines that were functional were NASTY dirty...to anyone from the class reading this> NOT COOL. It took me an hour to start working! So following the instructions provided in the Skill Builder was really easy. If I had to speak of anything that wouldn't work it would be maybe my only mistake (really bad one) during set up. 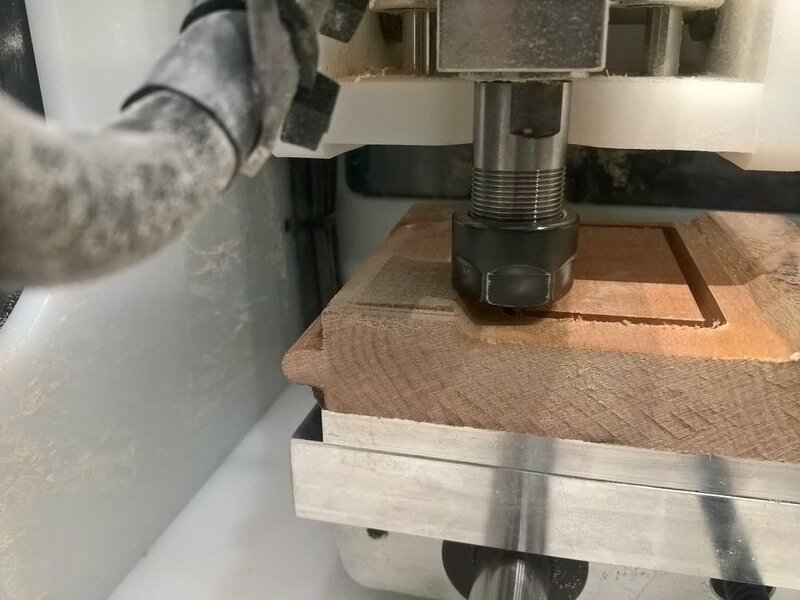 So i adjusted my material thickness to the thinest part of the board, not the thickest, luckily this machines that seem so delicate make me so nervous that I hit the big red button before the collet hit the side of my wood panel. Once I had to re-start the adjustment with the proper measurements I imported my file. Now this was the tricky part, when it came making the machine do what I wanted. When I was setting up the file I could distinguish from cutting and engraving. So I decided to start off with the engraving so I could see if I liked what I saw, but the option to cut or cut visible just got disabled. I had to activate both cutting and engraving for the option of Start cutting and cut visible to become available. I tryed modifying the depth and still it wouldn't let me. So I just went and let it do its thing. And it started by cutting. But sadly couldn't make it all the way through as I had my bit too short for the thickness of the material, this meant I had to press the big red button again and loose what was about to be a perfect job. Now it is time to go get another piece of wood and strive for the design I really wanted. First time using UNIX to create new text = very happy me. I loved the process of using the UNIX commands of creating texts in the terminal (getting .txt files and modifying them with UNIX commands that would cut it, paste it, rearrange its lines and sort them again), it felt like a very crafting process, trying the command and printing the result, then trying something else and printing it again until I had a result I liked. So for this first try I picked the text of three emails I recieved throughout the past week regarding my international student status and I remixed them with the text that was provided from wasteland. The result were three letters of empathy, hope and safety. As an immigrant to this country, a former green card holder, and now a citizen of the United States, I have a heavy heart this morning as I watch the events unfolding at our nation's borders and at airports abroad. The dreams and aspirations of many, including some of our own students', are at risk of being disrupted before they have begun. On the heels of this sudden federal government order banning entry into the U.S. from certain countries, which has frightened many in our University community and left them feeling uncertain, I want you to know about the steps we are taking to help our students and scholars from those nations. The United States is a nation founded on the principles of welcoming visitors from other shores. As a scientist who studied and worked in four countries before becoming a citizen of the U.S., I know how important it is to be able to move across borders in peaceful pursuit of one's scholarship. I know, too, more than most given my background and my field, how much goodwill the U.S. earns for itself through the openness of its education system and how widely those who study here can spread American values. And I know, as well, that these developments are not just a matter of disrupted educational plans or lost opportunities or even damage to the academic enterprise; beyond all that, this order harms one of the most admired and cherished of American principles -- religious non-discrimination itself. contribution to our community and want you to know that we are here for you. presence enhances our community and we value your diverse perspectives. International Student Office can direct you to other resources on your campus, as well. As a scientist who studied and worked in four countries before becoming a citizen of the U.S. I really like how these after a lot of trial and error, repetition, and experimentation these three pieces came to be. Their character, their message and overall the love of their words is still transparent. This was a lovely adventure into the new world of USB HID devices and designing controls. Since I am veeeery sloooow at both learning and implementing I started off with example codes. 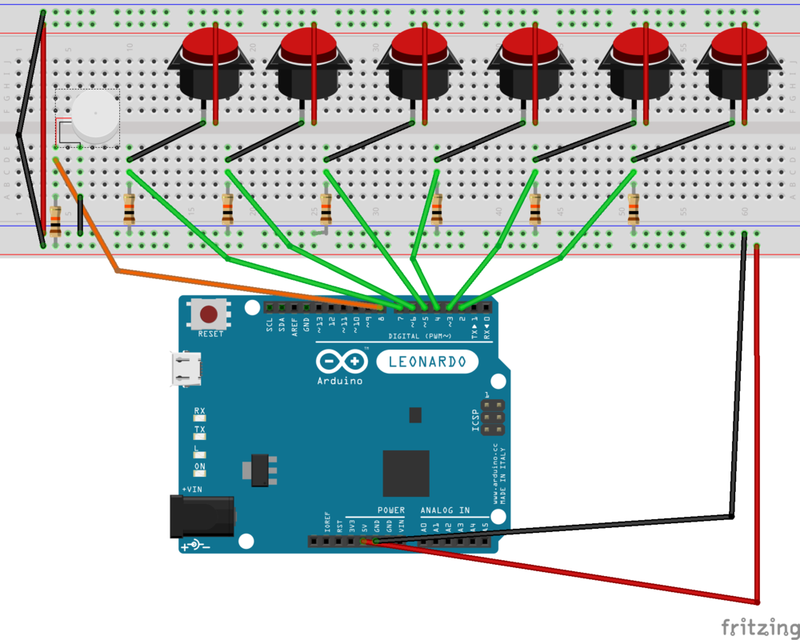 So I started by tinkering with the Keyboard and Mouse Control example of the Arduino library. In order to make it work I had to of course get my circuit right, and then figure out how the code was working so I could get rid of the unecessary mouse part of it. This meant the fun surprise of seeing the series of 4 letters invading my screen. After understanding how to print letters on the screen I went along and figured out how to press keys. so from the Keyboard Reprogram example of the libraries I was able to see how the calling of actual keyboard keys was happening (I went for the new document option of it). But it finally worked!!! Success!!!! No onto fabrication. Since I am TERRIBLE at video games because the controls just don't translate to me what need to happen on the screen. Don't try to face me on Guitar Hero or Dance Revolution because I'll crush you. I decided to recreate a spacecraft and see if I could arrange the buttons to respond to what my brain expected to happen. For this porpuse I had to arrange my board and arduino in a neat sandwich, wire it, get in the space craft and voila! Even though Shaper (see following video) is almost a reality in this world, learning how to use a hand router is to powertools for making what learning how to hammer is to basic wood-working...right? So in this train of though our first power tool for the semester was this wonder maker cutter. The task: cut an incomplete circle. A couple of more turns, another go, and the curve part of my cut was done, now onto the straight line: Easy, I mark it and I fix the jig down to follow along. Eventhough the job was done: YAY! and I didn´t had to break my head with something awesome and creative to do, I still felt disatisfied with just having a something, so I decided to try and imprint some function to this something. This meant using the band saw, laser cutter, band sander and sand paper (felt so nice to breeze through all these tools). How a hand router is put together. How satisfying it is tu cut with a jig attached to the hand router. I need to use the driver more often. It is so nice to know what you are doing and just go ahead and do it. Using the noise cancelling ear covers takes me to a land of ZEN where I can work fast and focused. Using the hand router is chiseling in 2D. Laser cutting is chiseling in 2D with a precission machine: patience is required. CAN'T WAIT FOR WHAT IS TO COME! After a month of exploring and testing concepts around possible ways of showcasing issues related to air quality Shelly (Xinyu) Hu and myself were able to develop an interactive object that has the goal of explaining in the simplest of ways the relationship between the quantities of different chemicals in ocean ecosystems and the overall state of our environment's health. Since Midterm I had been toying with the idea of the News headlines as tellers of what the future will hold for the world. In order for the project to display I would need to have some serious machine learning skills to code my AI...but I don't so I actually made a muckup by devising a very simple conversation tree. Which creates answers based on the user imput provided by the buttons taht become available as the conversation advances. The text and categories selected for the conversation tree were inspired by this article on The Harvard Review about the main reasons why people read the news. Drawing from it I tried to create three conversation tropes, with the goal of keeping users engaged with the system through providing the feel of a real conversation they would have on "The Future" and world events. This project will be deffinetly keep on being worked on. So any pointers towards any help advisement or mentorship is greatly apreciated. The p5js sketch can be found here. Artschool is expensive: that seems to be the general agreement. If you are going to be making stuff you are going to be spending big bucks in fancy materials. This class has taught me a completly different way, I have learnt that as important as the proper tools are, to have a clear knowledge o the result you are going for is incredibly more important than the materials you are going to be building/fabricating with. Genious actually is materialized through limitations. As I mentioned in the enclosure post it has been inevitable to merge Pcomp final and Fabrication, and is actually that project what I'm continuing for this final delivery. But, what is all this talk about material costs and solving problems within scarcity about? The class before this delivery we were introduced to several pre-fab options to mount motors, connect thei shafts to the moving mechanism and even moving mechanisms themselves. All magnificent options to create incredible finalized projects but the question is: How much of a finalized project are we turning in? I know for sure that regardless of all the work that has been put into designing, prototyping, building, playtesting and correcting, what is going to be shown is still a product in process. Which is getting to a quite decent and solid place as a project, but not a finalized project yet. But enough talk and more show. So for the sake of this argument this motor mounting was built with nothing but humble materials and knowledge from the proper techniques learnt in class. And that is that, a lot of technique, a little of investment, and a motor that is perfectly fixed and performs wonderfully. This piece starts off with rythm, provided by an off the chart project, The Flashlight Beta. With its main tune delivered by cardboard and plastic the orquestation of water, oil, a basic LED circuit and a lot of Hot Glue, gives way to the rythmic part of the composition. A pair of artificial lungs made out of two humble materials show how can life can be sprung out of the simpliest of forms if they are stroke correctly. So in this way traslucent tape and pillow filling rise the beat of this medeley. And to bring everything to an end: the broom rack. A beautiful piece of oak wood (interestingly soft and firm at the same time) and wire make up a very useful household device. This is the deal...finals are hard, finals happen all at the same time, finals have my head spinning. 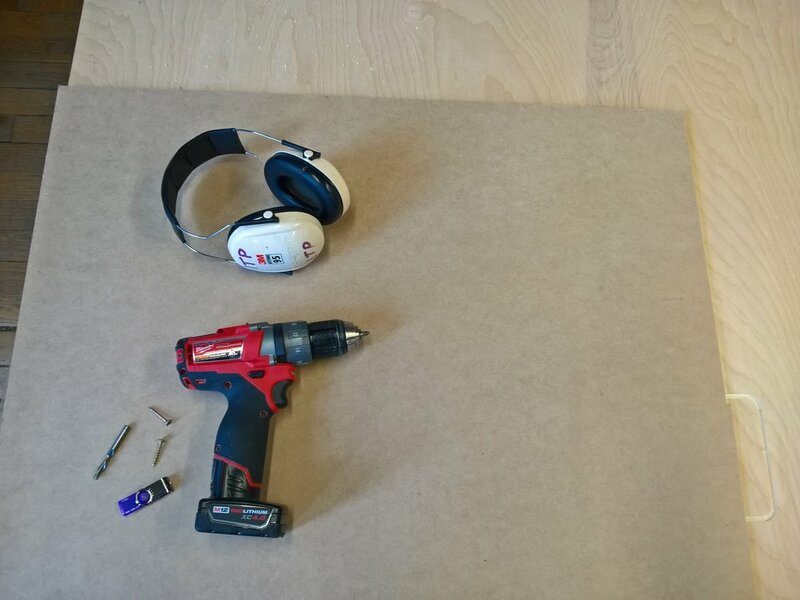 We've gone over the subject of how hard it has been for me to up my coding skills, I was hoping to be able to apply what I had to my soundscape idea, turns out I wasn't even able to scratch the surface of a semi built project. So in the spirit of efficency and pragmatism, I recovered my midterm sketch and decided to make it grow. My goal for the final? Expand the conversation this initial fortune teller is able to engage in, into a more extended conversation that will maintain the original idea of inviting a reflection towards thinking of our hopes and dreams for the future within the world we exist in. Now committed to this project I went along and created a mockup for user testing, from which I've extracted excellent ideas to further develop this website in none less than ONE WEEK!! No I did not build a jack in the box...wish I had because it looks crazy fun, but I actually didn't. Since these days are all about Pcomp and ICM finals I went for these days go to "Pcomp meets current everything else in life" Trope. 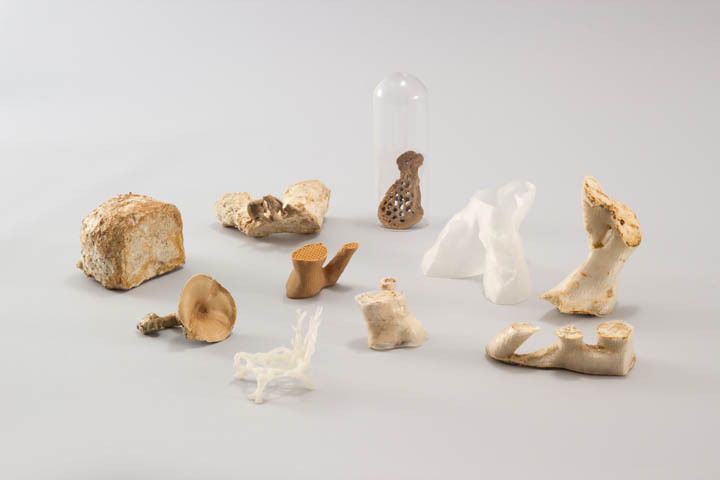 My project calls for the fabrication of six almost indentical encolosures to hold the lungs that are making up the instalation, so I welcomed fabrication assigment into the figuring out process for said enclousures. Where does the servo need to rest? what is the ideal separation of the walls so the lung shaft sits in the middle and also the servo works the best way? So I measured the prototype away, and yet ended up having to use purple foam to set the servo in what apeared to be the perfect place. This new prototype enclosure remains to be play tested, and if it works then probably apropiate materials could be devised towards its building and replication. As I previously promised I wanted to keep on working on the flashlight project. This time a developed a fully functional prototype with the aid of lots and lots of hot glue.